“We have had the end of the world with us ever since the world began” – Anthony Burgess. Aged ten, Anthony Burgess witnessed the total eclipse of the sun in 1927 and believed the world would end. His fascination with apocalypse stayed with him throughout his life, and appears in his fiction and film writing. Here we present three films about the end of the world as part of our FUTURE FICTIONS season. The dinosaurs were the most recent victims of a comet crashing into the Earth, but that hasn’t stopped us worrying about it happening again. 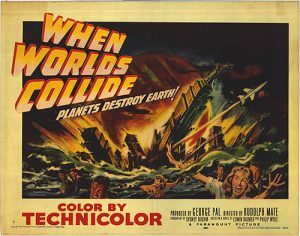 This special-effects laden adaptation of the 1932 novel by Philip Wylie and Edwin Balmer speculates about how we might deal with a catastrophic impact. Anthony Burgess’s Puma – his science fiction novel, published for the first time in its intended form this autumn – is based on his unused film treatment for a remake of this film. Will humanity survive? “Its power is greater than all hydrogen bombs. Its speed is higher than any rocket ever conceived. Its force can shatter continents. Its mass can level mountain ranges. It cannot think. It cannot reason. IT CANNOT CHANGE ITS COURSE.” The asteroid Orpheus is on a deadly collision-course with Earth. The only chance is to combine the efforts of the USA and the USSR: but can the governments put aside their differences? 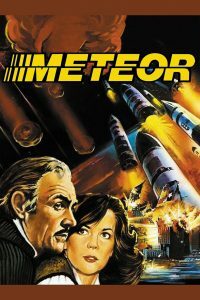 Anxieties about the Cold War and the nuclear arms race are explored in this quite bad film of the 1970s. 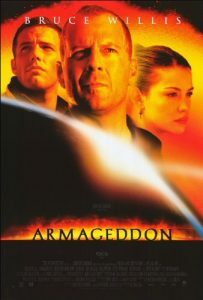 Once again the Earth is threatened by approaching asteroids, and this time a motley collection of mineworkers is sent into space to try and destroy them. Can they explode us to safety? The preposterousness of the acting and script is matched only by the extravagance of the special effects in this increasingly cult film. Enjoy the ride!